OVERALL IMPRESSION: This book is more about the aftereffects rather than the incidents themselves. I think most people don't image all the ways someone can be affected by something like this and just how extensive the damage can be, even for someone's future. I'm having a hard time getting my thoughts down about this book because the subject matter is just so heartbreaking. This isn't a happy book, so be prepared if you choose to read it. CHARACTERS: I feel disconnect from the characters. I don't know anything about anybody so that makes it hard to get into the story because I don't have strong feelings towards any of the characters. COVER: I am obsessed with the cover. The actual hard cover of the book has a silhouette of a teenage boy on it. 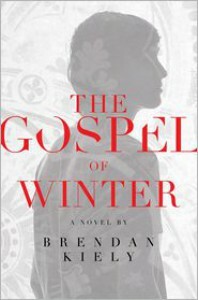 The dust jacket has bright red words on it and a pretty gray design that looks like a stained glass window, but it is all printed on vellum so when the dust jacket is on the book, you can see the silhouette through it.